From September 1981: another STAR WARS mailaway offer from Palitoy... and this time it was a biggie. Literally. 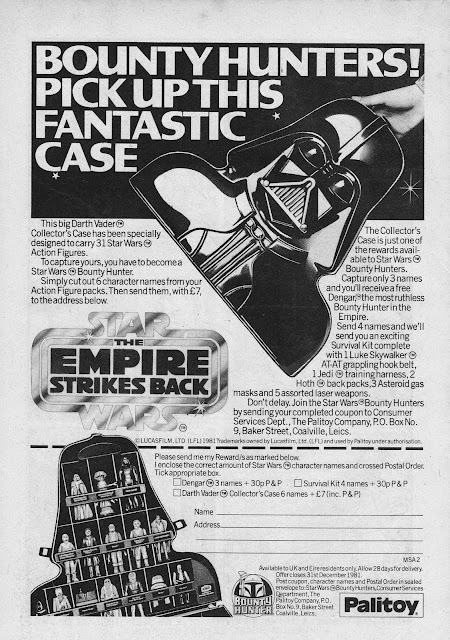 The DARTH VADER COLLECTOR'S CASE (which I did send off for.. although, to this day, I'm convinced that I actually ordered the Dengar figure and this arrived instead) was, by some margin, the biggest (in every sense) of the items included in the "Bounty Hunters" promotion. Just look at the whopping Postage and Packing fee. Incidentally, Kenner toyed (hohum) with plans for a C3PO version later in the run so tested the required finish by rendering a test run of gold Darth cases. The plan was abandoned. and did you have to wait as long as the other chap I spoke about here ? Although I passed on the vader case, I did order the ' exciting ' survival pack with its assortment of easy to lose accessories. Funnily enough, I do think there may have been a delay with delivery although the memory may cheat after such a long period of time. I don't have the collectors case any more but it was a pretty sturdy construction, made out of black plastic. I do remember that Darth's shape made some of the storage compartments (there was also a little sealed compartment to safely keep accessories such as the underwhelming survival kits) inside pretty pokey. Fortunately, Palitoy made enough smaller figures to fit in the odd shaped spaces. The Darth Head was also sold through stores and I don't think it was ever a Bounty Hunters exclusive.